Let’s Be Excited About Reading! 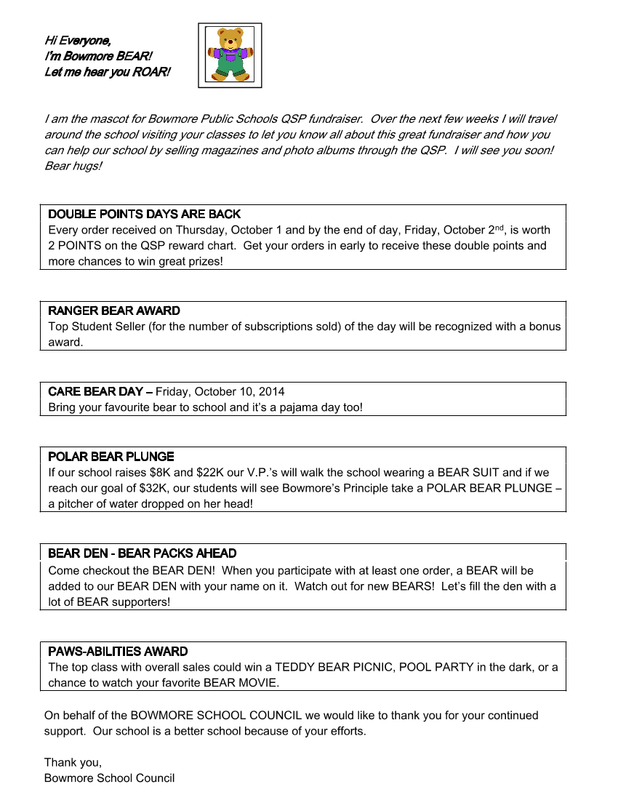 Our QSP magazine fundraiser has returned starting on Wednesday, October 1st and ending Wednesday, October 15th! It’s that time of year to renew your magazine subscriptions and find new ones from the list of 600+ magazines and more digital magazines. New this year you can purchase photo albums online and donations from this purchase go to the fundraising campaign. OUR GOAL THIS YEAR IS TO RAISE $32,000 gross sales for Bowmore Public School. We need an average of 3 subscriptions per family in order to reach this goal. Please remember that these make great gifts. Where Do Our Fundraising Dollars Go? We would like to encourage you to order online via http://www.qsp.ca You will save $1.00 processing fee for ordering online and your order is processed quicker. Should you wish to order by cheque, please make cheque payable to BOWMORE SCHOOL COUNCIL and please add $1.00 for manual order processing fee to the total amount. How Do We Put the FUN in this Fundraiser? It’s Time to Come out of Hibernation and Celebrate! Learn about the prizes that your child can win! On behalf of the BOWMORE SCHOOL COUNCIL we would like to thank you for your continued support. Our school is a better school because of your efforts.